Bruce Canepa's passion to race cars burned so hot that, at 15, he fibbed about his age just to run a "claimer" stock car on the dirt oval at Watsonville Speedway near his home in Santa Cruz, CA. That was 45 years ago and Canepa hasn't lifted the throttle since. His lifelong pursuit of speed has evolved into a motoring empire based in Scotts Valley, CA, that includes a design and engineering center, a technologically-advanced "clean room" restoration and fabrication works, a collector car sales emporium and a museum showcasing his own personal best race car choices. One exceptional vehicle from that collection - the Andy Granatelli Kurtis roadster that placed 4th in the 1953 Indianapolis 500, Freddie Agabashian driving - will be among featured Indy race cars on display in the 3rd Annual Marin Sonoma Concours d'Elegance, May 15, 2011, at the Marin County Fairgrounds, San Rafael, CA. The Indy cars honor a century of racing at the celebrated Brickyard and comprise just one contingent among more than 175 classic, historic and elegant motor cars shown on the expansive greens near Marin Civic Center. "We're delighted that Bruce is bringing for public showing this perfectly restored timepiece," said Charles Goodman, Marin Sonoma Concours d'Elegance chairman. "These great roadsters remind us that the Indianapolis 500 lives on forever with enthusiasts as truly 'the greatest spectacle in motor racing.'" Running in 1953 as the #59 Grancor-Elgin Piston Pin Special, the 1800 lb. roaster was powered by a 404 hp Offenhauser 270 four-cylinder engine. Agabashian qualified the car second behind racing legend Bill Vukovich. He dogged Vukovich until the 102nd lap when, exhausted by the extremely hot weather, he was replaced by driver Paul Russo. Only five drivers would go the entire distance that year. Through a scoring error, #59 was listed as the fourth place finisher. Owner Granatelli was convinced they finished second. Granatelli chose not to embarrass the Speedway by challenging the outcome, but track manager Wilbur Shaw acknowledged the error and the car's second place finish was officially recorded. The car probably posted the first 140mh+ qualifying lap in 1954 (Jim Rathman driving), but went out with engine failure. 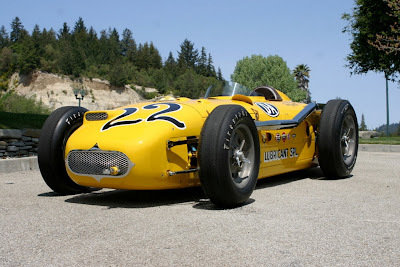 In 1955, and running as the yellow #22 D-A Lubricant Special that will be shown at the Marin Sonoma Concours d'Elegance, the car crashed on lap 170 (Cal Niday driving). Sold and stripped of parts, it was stowed for 30 years in Southern California until discovered in the mid-'80s. After its complete restoration, it took third place in the 1996 race car class at Pebble Beach. Canepa's museum, which is open to the public, is an eclectic reflection of his favorite speed machines and features everything from LeMans Porsches to the red and white 1954-era SoCal hot rod lakes coupe. If it moves rapidly, Canepa's driven it. He's raced Go Karts, Super Modifieds, Sprint Cars and sports cars; he's competed at the top in IMSA and TransAm (3rd overall with co-drivers Rick Mears and Monte Shelton at the 1979 Daytona 24 hour race). He was second overall up Pikes Peak in 1981 in an open-wheel Porsche (also in his museum) and has three wins in the big rig truck class, including a record that still stands. Never resting, he's collaborated with General Motors and the So-Cal Speed Shop to take a run at Bonneville G/Blown Fuel Competition record in 2011. Rolls-Royce and Stutz are featured marques at the Marin motoring event and organizers will mark another century of American motoring history, this a decade-by-decade showing of Chevrolet automobiles. Vintage trailers, wooden runabouts (shown in the site's lagoon) and a special British car club gathering are among other show highlights. The Marin Sonoma Concours d'Elegance is a non-profit fundraiser to benefit Hospice By The Bay and will also include "The Drive," a separate motoring event benefiting the Hospice and to be held Saturday, May 14. Copy and photos provided by MDPR. Top: Perfectly restored to its bright yellow 1955 racing configuration, this Andy Granatelli Kurtis Indy roadster will be among featured racers honoring a century of racing at the celebrated Brickyard during the 3rd Annual Marin Sonoma Concours d'Elegance. Center: The #22 D-A Lubricant Special as it ran in the 1955 Indianapolis 500, Cal Niday driving. Bottom: With Oakland, CA, driver Freddie Agabashian aboard, the Granatelli Kurtis roadster ran as #59 Grancor-Elgin Piston Pin Special in the 1953 Indianapolis 500, officially finishing 2nd.